The fourth Caspian Sea summit is underway in Astrakhan and Russian President Vladimir Putin said he was hopeful that the five Caspian littoral states (Russia, Iran, Kazakhstan, Turkmenistan and Azerbaijan) will adopt a convention on the Caspian Sea legal status at the next summit. VoR's Tim Ecott spoke to Dr Nikolai Kozhanov, a senior lecturer in political economy at St Petersburg University. Russia, Iran, Azerbaijan, Turkmenistan and Kazakhstan are meeting to discuss issues surrounding their joint ownership for the coastline and resources of the Caspian Sea. President Putin is known to favour a strengthening of bilateral trade relations with Iran especially, but security issues in the region are also crucial. “The work on preparing the convention on the Caspian Sea legal status is to be completed. I’m confident that we’ll be able to agree on the provisions that have not been coordinated yet and adopt the convention at the next summit,” Putin said at the Caspian summit. The next Caspian Five meeting will be held in Kazakhstan. 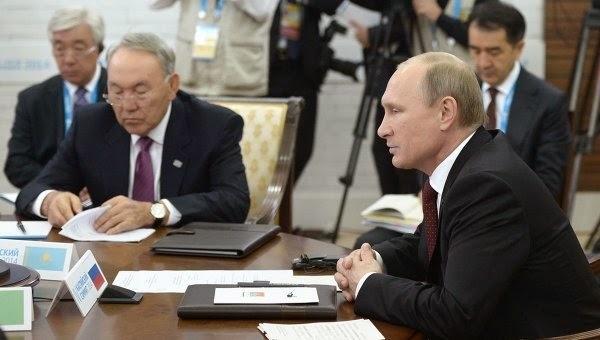 Putin said within the narrow-format meeting the summiteers have coordinated a political statement on key principles of pentalateral cooperation in the Caspian region. Dr Nikolai Kozhanov said: “The issue of the legal status of the Caspian Sea will be discussed. The sides are trying to work it out and step by step they are approaching a final agreement. There will not be breakthrough at this summit but there will be another step towards signing an agreement in the future. “The sides also traditionally discuss how the security situation in the region should be ensured. Finally the economic issues are discussed. The President of Kazakhstan proposed the formation of the free trade zone in the Caspian region. “It is a complex issue. Essentially, the issue is: ‘how should we divide the Caspian Sea?’. In more detail it is a matter of how big the zones for fishing should be: whether there should be free navigation or - if we decide to control ships controlled by other countries - should we allow them to just ask for permission to enter the zones? It is very complex and different countries refer to different treaties. “Russia and Iran take the agreement signed in the first half of the 20th century as a base for the future agreement in the five countries but as the Soviet Union doesn’t exist anymore the other countries dispute this. “The issue about oil resource exploitation is big but Russia has no territorial questions. The main question isn’t who is going to exploit oil resources of the Caspian Sea but whether the transportation of oil and gas via the Caspian Sea should be allowed.